There is a certain optimistic energy to the butterfly and blossom pairing Jane used to design this fabric. We've isolated the design for several projects and never grow tired of looking at it. That's why we thought it would make such an excellent mouse pad . . . every time we look at it we get energized and cheerful! 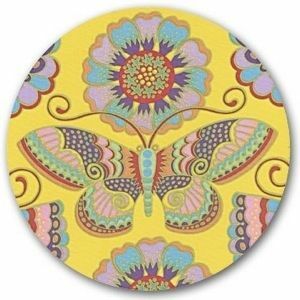 We've captured the beauty and energy on the highest quality, 8" round fabric-top pad with a substantial 1/8" non-slip rubber backing. It’s printed in the United States.